great roof top deck for sun & stars! 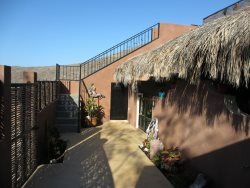 This 2 bedroom unit has great views from the master bedroom as well as the 2nd floor deck and the 3rd floor roof top. This home sleeps 4 people, in 2 bedrooms. There is AC in the master bedroom as well as the main living area. Large fridge for your libations, along with a water system for your ice, and drinks. This home has lots of shade for the outdoor living space. There is no home in front of this unit. Just great vistas of Cerritos Beach from the 2nd and 3rd floors. ADULTS Only! No Children or Pets! we are in close quarters, please be mindful of your neighbors!